MacArthur Genius Award-winner Ruth DeFries, an expert in the study of the human impact on our environment, counter's the idea of humanity's eventual demise and collapse by offering a positive examination of human capability. 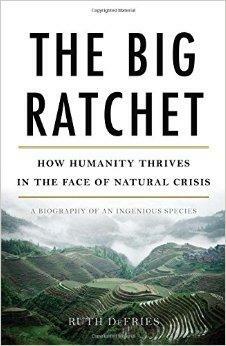 Her book is, "The Big Rachet: How Humanity Thrives in the Face of Natural Crisis." Dr. John Cmar, an infectious disease specialist at Sinai Hospital, continues our coverage of the Ebola epidemic in West Africa with a look at its impact on infectious disease control in the United States. We'll also talk to Elizabeth Serlemitsos, of the Johns Hopkins Bloomberg School of Public Health Center for Communication Programs, who is in Liberia working to control the spread of the virus. In May 2011 Congress reported that private military and security contractors outnumbered U.S troops by a ratio of 10 to one. These contractors provide everything from intelligence analysis to diplomatic security, and they even replace American forces after they withdraw from combat zones. Author and journalist Ann Hagedorn deconstructs the U.S. military’s increasing reliance on the private sector and problems with that relationship in "The Invisible Soldiers: How America Outsourced Our Security." Nationally recognized grammarian Mignon Fogarty, aka "Grammar Girl," of the website "Quick and Dirty Tips.com," answers listeners' grammar-related questions.